This outfit goes with your “about” perfectly! Such a gorgeous outfit! I love all the layers and textures! I agree, colour is fabulous, but black and white is so classic. You look lovely in this outfit. Black and white is such a classic colour combination. I love this, Jen! All of those Yesstyle pieces especially go together… I am loving all the textures there. You can’t go wrong with black & white! So chic! I love this outfit! Love all the layering and all the different textures!! 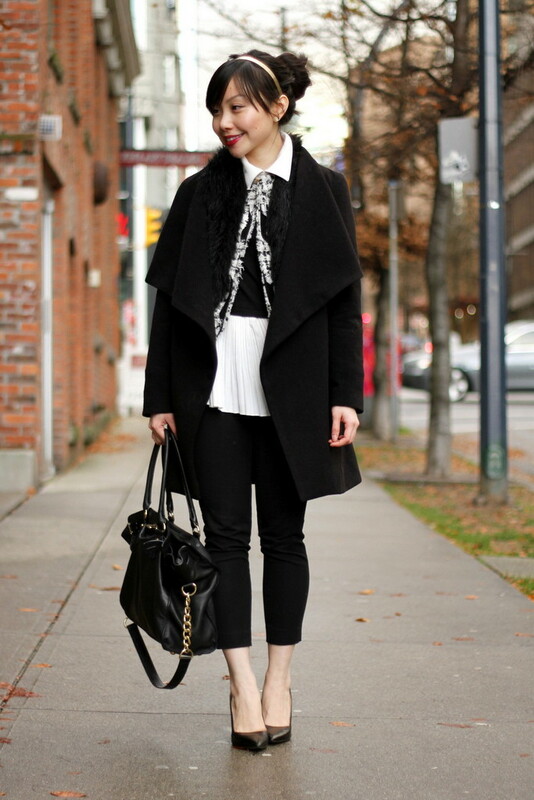 that;s a lovely outfit!great classic black and white combo.love your bag and shoes. Oh my, I love that bag so much. Hi I am new to your blog via through Nancy at Marcus design,and already I am so inspired by you and especially because you live in my beautiful little city,look forward to reading the ongoing inspiration! P.S. black and white is my favorite! Very nice ! Love the bag! You are so pretty. love the look! Gorgeously chic and sophisticated! Just found your blog through Nancy’s and I have to agree, you’ve got MAD style hun! Love all the layered pieces and yummy fur vest! I used to live in the NW and LOVED seasonal weather when I could play up the wardrobe to reflect the changing times…alas moving back to SoCal makes me miss the rain even more! Can’t wait to see more from you! I applaud you for going open-footed in such cold weather! I love this look. Even though it’s black and white, there’s so much interest created by the different layers and textures – very chic! Love the coat and shoes! I’ve never heard of YesStyle. How reputable are they? Are they a US-based company?